Winner, Benjamin Franklin award for Best Craft Book of 2010. Over 50 Proven Techniques to Achieve Brilliant Color with Your Stash Transcend “matching to the focus fabric” and instead develop your own imaginative color combinations. 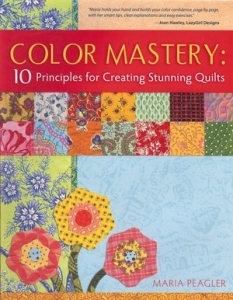 Whether you are a traditional quilter trapped in a color rut or an art quilter looking for a deeper understanding of color, this book is your essential guide for a revolutionary new way of approaching color in your quilts. Includes 6 easy yet elegant quilt projects, plus 3 bonus projects! Maria Peagler has won awards for both her fine art quilts and her writing. Her background as a watercolor artist and an instructional designer for the nation’s top training company enables her to take a fresh approach to color coaching for quilters.